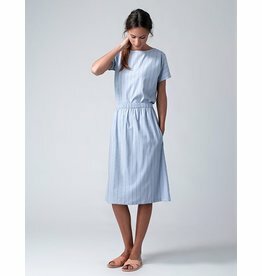 Straight dress made from very soft lightblue striped fabric. Button closure at the front, mandarin collar, cuffed sleeves, drawstring waist with a self fabric cord, model wears a size 36. Light blue striped shirt with a round neckline and half long rolled sleeves. The stripes are placed in different directions, which gives the top a playful character. model wears a size 36.